4. Insulation class F, protection IP55. 6. Three phase: 220V/380V(50/60Hz) Single phase:110V/220V(50/60Hz). 1. Pump casing, casing cover and impeller are made of reinforced engineered thermoplastic. 2. Motor shell is made of high quality aluminum alloy with excellent heat dissipation effect. 3. 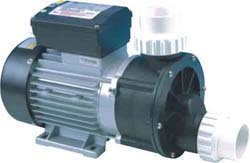 Single phase motor has built-in thermal protector which makes sure long time running without motor burn out. 4. Equipped with pneumatic switch operation, to ensure easy usage & safety. 5. When motor is off, all the liquid in the pump will drain out rapidly.